Rich and and I starting to attend a new church, and I was thinking about this post that I wrote for A Deeper Story a year ago. I still have a lot of reservations about church right now, but there is truth in this post that I need to remember. I couldn’t tell you the last CD I bought for sure. I think it was Jonathan Coulton’s Artificial Heart, because when I preordered it, I could get the MP3 sooner. When I got my first Kindle, I abandoned purchasing real books in favor of eBooks. When I discovered Vudu, I abandoned movies in disc form. My pictures live almost exclusively on my phone or computer. Most of what I consume is stored out in that magical place called The Cloud. I appreciate that. I’m an unorganized person, so keeping clutter down in my too-small-for-a-disorganized-person-house is fine by me. Stuff morphs into mess in the blink of an eye for me, so anything that I can do to cut down on the stuff I have is a positive action. Watching the world become increasingly digital may feel like blasphemy to those who want the sound of the needle on vinyl or the smell of a book that hasn’t been cracked open in a while, but for the person who feels like she’s cleaned when things are piled instead of strewn, there are concessions that need to be made. When everything fell apart in my life, I uncluttered. Everything stripped down to the bare essentials. I jettisoned clothes that I didn’t wear, books that I didn’t read, knick-knacks that had no value. Everything that I deemed unnecessary given away, thrown away, abandoned. For a season, I did the same with the church. I didn’t want the judgement, the disapproval, the whispers. It all felt like baggage that I would rather leave behind than take with me. 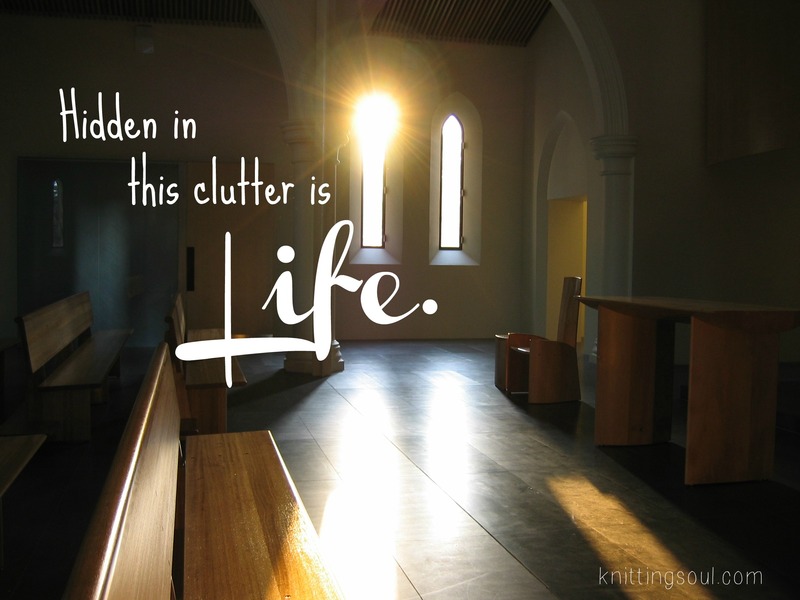 I added the church to my uncluttering pile – things I didn’t need, things I wouldn’t miss. I could manage digitally. A sermon podcast by my favorite pastor, a Spotify playlist of my favorite hymns, these would sustain me and would be less messy than being a part of a congregation. But just like there are times that you crave the weight of a book in your hands and times that you need to have a physical picture on your desk, there were moments when my virtual church was insufficient. It couldn’t send me messages when I waited by my mother’s hospice bed. It couldn’t bring me a casserole when my son was stillborn. It couldn’t help pack up our belongings when we needed to move. The church service was over. My husband talked gear with some of the other musicians on the praise team. I sat with the worship leader’s wife, looking through her wedding album, since that Sunday was their first anniversary. We headed out into the parking lot with all of our gear and had a conversation with another woman about the time that she bought a new car and then forgot what it looked like and couldn’t find it. I wanted to get home to eat lunch and relax for a little while before the start of another busy week, but there were hands to shake, bodies to hug, conversations to be had. Interactions that could be messy, that may be the source of pain later down the road. But it’s worth it to me to reclutter my life in this way. Hidden in this clutter is life. This entry was posted in Church and tagged church, faith. Bookmark the permalink. Beautiful. Thank you from a person who holds on to stuff way too long. Thank you for touching my heart today. Yeah, I feel you on this. I have thrown away A LOT…both stuff & I have distanced from A LOT of people (I figured, well, he “won” those people in the divorce…they don’t want me anyway). I’ve had some second thoughts about people I distanced myself from. I just found out one of them is very, very ill. I was thinking before, “i don’t need those people who were ours –he can have them!” But, I didn’t think about… what if any of them needed me? I guess, I’ve been understanding a bit more lately, the continuous fall out of divorce…because, some of those folks, I don’t even know what I should do. The stuff? I’m happy I don’t have that. The people? Iffy. (though of course, there are some who I am deeply glad I have distance from). Throughout all of this, though, I’ve had my new Church home & you are right, there are just some things, no matter what, you do not let go of. ” Hidden in this clutter is life”…I need that on a plaque!